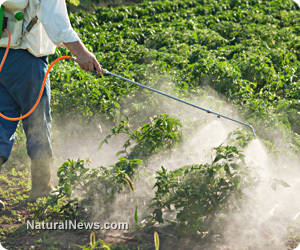 (NaturalNews) Over the last 30 years, the use of pesticides has spiked around the world. People now pour 2.5 million tons of these chemicals into the environment annually, contributing to a $35 billion industry run by global corporations. To make matters worse, the more people use pesticides, the more ineffective they become. Why are crop yields lost to insects greater than ever before, when pesticide use is at an all time high? Take a look at the citrus greening crisis happening in places like Florida and California. Citrus greening is a disease spread by the psyllid insect. This insect contaminates citrus trees by leaving a trail of bacteria that ultimately kills the trees. Florida is currently witnessing a 10 percent reduction in produce because of this. Problems like these exist because pesticides are killing beneficial insects, like lady beetles, that were created to feasts on pests like psyllids. By killing lady beetles, pesticides destroy a balanced ecosystem. So are pesticides doing more harm than good? Pesticides are ravaging the environment. Farmers and researchers are now witnessing the death of entire bee colonies because of pesticides. Billions of bees are disappearing from their natural environment, as they cannot handle the poisonous nectar they're pollinating from contaminated flowers. Some people are completely aware of pesticides' ability to disrupt the thyroid, adrenal and pituitary glands. These glands control hormones in the human body which guide the development, growth, gender, behavior, and reproductive systems. That's why some people wash their fruit and vegetables before eating them. The sad reality is that pesticides exist not only as residue, but are also pent up and stored inside plant tissues. In fact, systemic pesticide use is on the rise. These chemicals, first used in 1998, have now spread to most of the conventional food supply. Systemic pesticides travel from the soil and are absorbed into vegetation, moving through the xylem and extending into the leaves and flowers, where they infect pollen and nectar. Four classes of pesticides have become commonplace and include imidacloprids, which are applied to vegetables like tomatoes and leafy greens. Thiamethoxam is typically used as seed "treatment" for corn, but is now applied to soil for fruit and vegetables. Clothianidin is also a seed contaminant, used on canola, cereals, sugar beets, and potatoes. Dinotefuran is either applied to soil or sprayed directly on leafy greens, including cucumber crops. Tests conducted by the US Department of Agriculture from 1999 to 2007 report stunning levels of systemic pesticides in conventional produce. They found that 70 percent of broccoli and 74 percent of fresh lettuce contained imidacloprid residues. Heavy levels of thiamethoxam were found in strawberries and sweet peppers. Worse yet, the tests found imidacloprid levels of up to 550 parts per billion in eucalyptus nectar and pollen - three times the amount needed to kill honeybees! Water droplets that exude from a plant's surface also tested positive for systemic pesticides; plants are practically bleeding out chemicals! The Journal of Economic Entomology reports, "When bees consume guttation drops, collected from plants grown from neonicotinoid-coated seeds, they encounter death within a few minutes." Additionally, systemic nitroguanidine pesticides can last up to 500 days or more in soil, affecting the ecosystem for up to two seasons, poisoning water, soil, worms, beetles, and bees which all play an important role in a thriving environment. • Stop using pesticides altogether and appreciate a balanced ecosystem. • Shop locally, but more importantly, shop organically. Put your money where your morals are. • Realize that the government is not protecting the population from harmful chemicals. Even though they have more regulatory agencies than ever before, big government is actually permitting these disease spreading, Earth-ravaging chemicals to persist.